Below you can find driving directions from Google Maps to help you get from Deerfield Beach to your nearest Fix Apple Now store, situated in Hallandale. You can either copy the driving instructions below or click here for a larger map and driving directions. 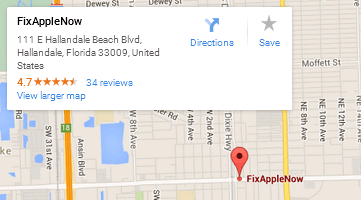 Do you have a broken Apple device in Deerfield Beach? Need a quick fix that will get right to the root of the problem? Then talk to Fix Apple Now today. At Fix Apple Now, we can fix, mend, replace, restore or replace your Apple device for less, so why not get the wheels in motion and call us today if your device is no longer working as it should and you need to put things right. Some of the most common problems we deal with include devices not switching on properly, home buttons not working, cracked and frozen screens, crackling noises and red screens. However, this is just the tip of the iceberg. Our engineers have experience in dealing with a whole host of problems and can be relied on to deliver the excellence you're looking for. We want to fix your Apple device and give it back to you in full working order. Talk to us today if you need to mend your iPhone 4,5 or 6, iPad, iPod, MacBook Air or Pro or Apple Mac in Deerfield Beach today.